Intellectual Property Protection | Meisterkreis – Deutschland e.V. Counterfeit products bring essential components of our social identity into question. This is particularly true for the imitation of high-end products from the leading cultural and creative companies which operate at the interface between culture and economy. Here the economic exploitation of their products does not change anything regarding their high cultural value or the artistic quality of their products. This is why protection of creative achievement and of the entrepreneurial spirit is not only elementary from an economic point of view – it also protects socially significant goods. At the same time it safeguards the values which form our society. Social standards, technological development and the protection of property are essential cornerstones of our coexistence. Counterfeiters do not care about these values at all. They usually belong to organized criminality and are solely geared towards maximizing profit at all costs. Social safeguarding, human and secure working conditions and fair payment are not part of this inconsiderate business model. Do you want to support this by purchasing imitation products? Intellectual property is property under law. Nobody would regard the theft of his or her car as a petty offense. How can we apply other standards to an exceptional creative achievement? How can it be that 90 percent of consumers do not see counterfeit products as being at all objectionable? Don’t creators have the right to adequately participate in the economic use of their property? The technological progress of our society also depends on the appreciation of the innovative achievement. Innovation strength, entrepreneurial spirit, research and development are the most frequently cited properties needed in order to survive crises. This is the result of a study of 800 companies by communication agency fischerAppelt. If investing in progress is no longer worthwhile, why should anyone continue to create originals? Our society profits from the high level of creativity and the innovation of individuals. A living culture and creative landscape contributes to the attractiveness of a place, a region, a country. And it also supports last specialised production and economic up-and-coming talent. It inspires the company culture and the innovative potential of the economy in the same way. This is equally true for products, services, art, music, culture, craftsmanship and engineering services. If we fail to sufficiently appreciate this commitment, we lose the basis that facilitates prosperity, safety and growth in our society. Intellectual property is one of the driving forces of the Germany economy. The so-called IP-intensive industries power this force. These are branches of trade whose success is based on their creative achievement and the innovative strength of its companies. Thus they need an effective protection for brands, patents and copyrights. Did you know that 39 percent of economic achievement in the EU – every fourth job – can be directly allocated to the so-called IP-intensive industries? In turn, ten percent of all further jobs depend on the economic development in this sector. The high-end segment is also an IP-intensive branch of trade. The companies in this segment which stand for exceptional creativity and quality in their respective branch are grouped together. This often results in their being the target of unscrupulous piracy. Discounting plagiarism, these companies would have about 80 billion euros more in turnover across Europe, there would be an additional 180,000 jobs and the states could cash in 20 billion euros of additional taxes – according to a study by Frontier Economics. An increase in forgeries of only about five percent would have serious consequences in this top segment alone: an additional loss of 98,000 jobs, 43 billion euros in company damages, 14 billion euros less in taxes. Or to put it another way: Product counterfeiting increases the tax burden for each and every one of us. Simultaneously, forgeries increase the prices of the originals. In order to protect the consumers and to safeguard jobs, companies are forced to invest in defending against these illegal forgeries. They also have to consider the losses incurred due to counterfeiting in the refinancing of their research and development costs. Every counterfeit product sold costs all of us dearly. The fact is that now it is not only the IP-intensive industries that suffer from counterfeiting. 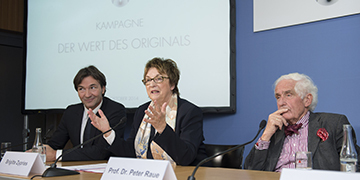 A lack in the appreciation of originals affects all companies: Worldwide, the counterfeiting trade amounts to more than 500 billion euros per annum. Cultural variety produces a wealth of ideas and creativity and is one of the keys to our economic success as well as our social and social development. Western industry nations are distinguished in that the plagiarising of ideas are usually penalised as a lack of one’s own-creativity. Here, intellectual property is a value which can even be legally protected from counterfeiters. However, the increasing availability of inferior copies results in these meaningful values of our culture being undermined. Currently nine out of ten consumers believe that the purchase of counterfeit products will not damage their reputation with friends and relatives. More and more consumers here are apparently ready to give up cultural achievements. Do we in fact really want that? This naivety poses is a very high risk of losing craftsmanship abilities and that special touch applied during the development and design. When the creative achievements of our designers, artists and engineers are no longer worth anything to ourselves – how can we then expect that others should continue to value our qualities? Counterfeit products are not an economical alternative to the original. They are actually a deception for the consumer. This is true even when the consumers know that they are buying a forgery. These counterfeiters themselves certainly don’t have any reputation to lose. They counterfeit in order to profit from the good reputation of the original product. They care nothing about their product’s durability, compliance to safety standards and, in the worst case scenario, even the life of the consumer. Do you want to touch forged textiles, watches and bags which were dyed with cheap but extremely toxic chemicals and manufactured with inferior materials? Do you want to drive a car with counterfeit brake lines which dissolve with every push of the gas pedal? Do you want to work with household appliances which had no safety testing whatsoever and are a ticking time bomb due to their defective processing? Would you like to take medicine which does not work at all – at best? Even seemingly harmless counterfeits can represent an incalculable risk for their owners. Only those who shop responsibly can protect themselves from these consequences. The MEISTERKREIS’ “Value of the Original” campaign uses counterfeit purchasing to inform the public about the economic, cultural and comprehensive social effects of undervaluing the creative achievement of companies. 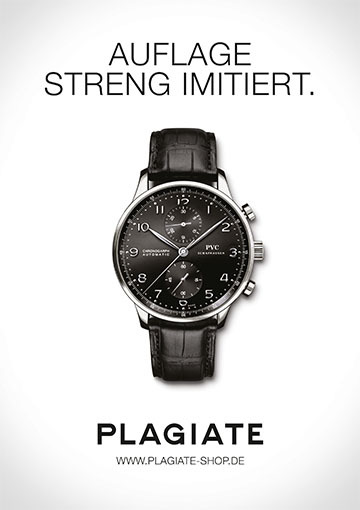 The campaign itself uses an especially creative approach: Together with the thjnk advertising agency the MEISTERKREIS devised a new brand that offers exclusive counterfeits: PLAGIATE. 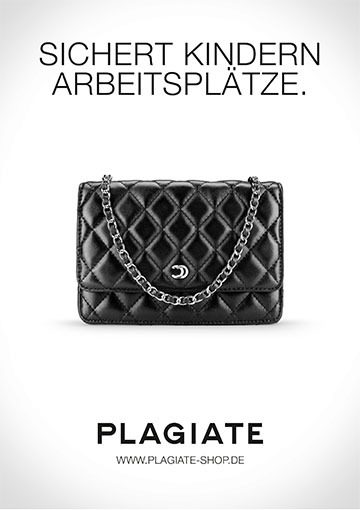 The brand even has a functional Internet shop, www.plagiate-shop.de, which is advertised for using online banners. Potential buyers can rummage through apparent offers of counterfeit products. Once a purchase is decided upon, instead of buying the copy, the user receives a range of information on the topics of creativity and intellectual property. 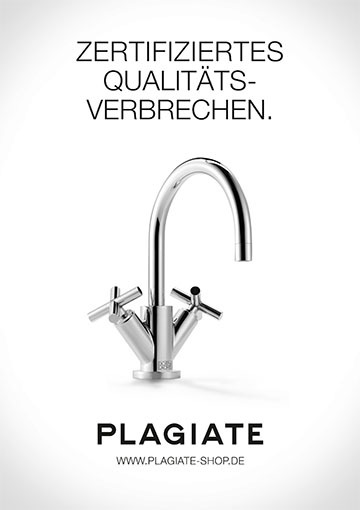 Attention-grabbing advertisements and posters further represent the disadvantages of counterfeit products: “Secures Jobs for Children”, “Certified Crime of Quality” and “Zeit zu Blenden”. This campaign has a gross media volume of more than 500,000 euros. The objective is to initiate a broad social debate on the protection of intellectual property and the appreciation of creative achievement. The background to this is an increasingly inconsistent consumer behaviour – consumers who appreciate creative services yet tolerate or even willingly buy counterfeit products. In Germany, most consumers see product forgeries as a petty offense: 65 percent of consumers have bought counterfeit products at least once – almost a third of them even knowingly according to a study by Ernst & Young.